The Bosun app currently provides a datasource for Bosun, and a panel to list open incidents. This plugin replaces the datasource plugin. This plugin turns Bosun into a datasource for Grafana 3.0 and later. This means you can use any Bosun expression to generate cool dashboards which are not possible with OpenTSDB alone. Grafana can display annotations created inside Bosun, which may add more context to strange metrics behaviour. 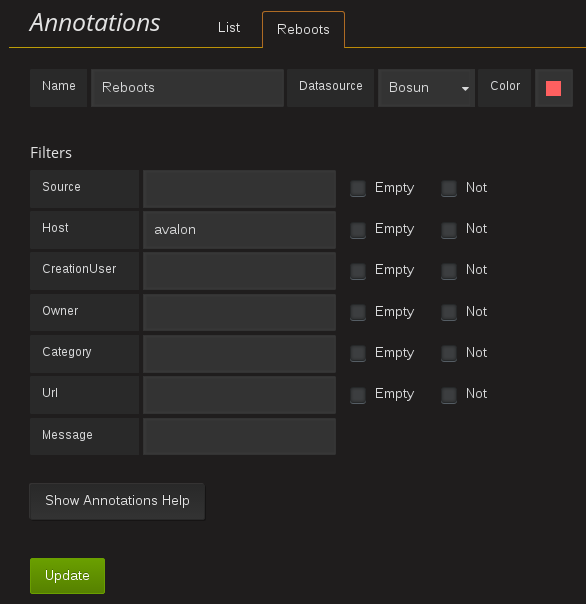 They can be filtered by any of the fields available in Bosun, and will be displayed like a standard annotation in Grafana. If you use Bosun to index data from OpenTSDB, it's possible to enable the Query Helper on data source configuration. Doing that enables a helper tool that is able to generate queries using metadata from Bosun. This makes it a lot easier to write your expressions. 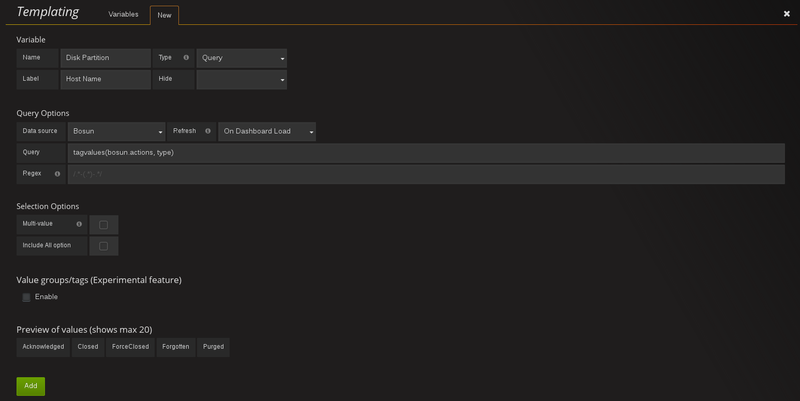 The plugin includes a custom panel that enable Grafana users to interact with Bosun incidents. You can query Bosun and display only incidents related to other information displayed on the dashboard, filtering by tags keys/value, incident status (Normal, Warning, Critical), alert name, among other fields. 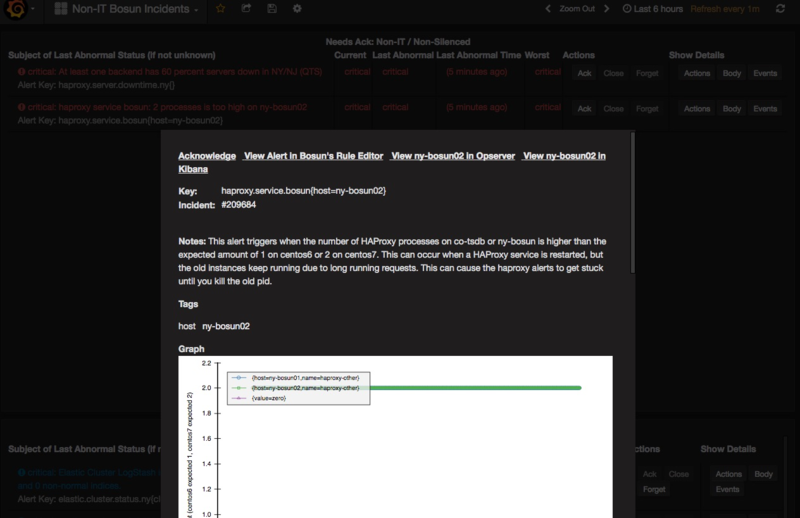 The user can then interact with incidents just like inside Bosun, taking actions and checking alert history. 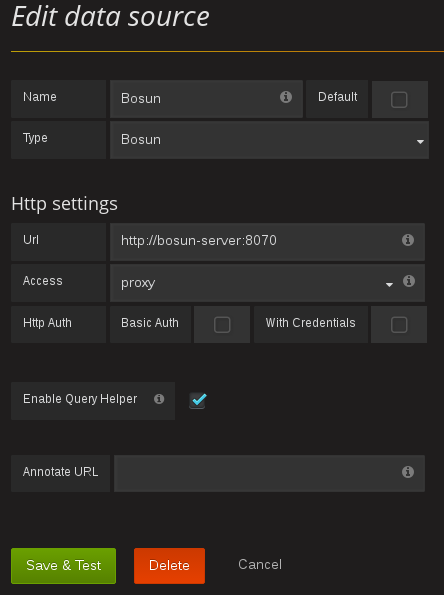 Besides Grafana, the plugin just needs a running Bosun instance. Because Bosun doesn't have support for CORS headers, it may be easier to make it work in proxy mode. Bosun also needs a ElasticSearch backend in order for its annotations subsystem to work.